Researchers in the Purple Mountain Observatory propose a mechanism accounting for this phenomenon. They think that the observed CPB is the survivor of multiple planet system which suffered planet-planet scattering (PPS) process. Simulations of the migration of multiple CPBs in gas disk showed that two planets will enter the orbital resonance configuration. As the gas in the disk dissipates, scattering between them will occur. In this work, theymodeled the PPS of CBPs and found that the mass ratio of the planet and the initial relative position are two important factors that determine the orbital elements distribution of the surviving planets. The scattering mechanism can explainthe orbital formation of Kepler CBP. 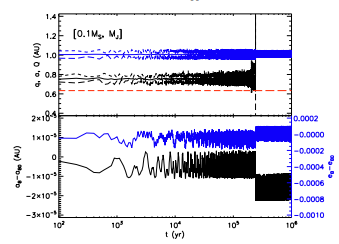 For example, the formation of Kepler-34b is shown in Figure 2. Fig. Upper panel: time evolution of SMA (a), pericenter (q), and apocenter (Q) distances of two planets. The initial inner planet was ejected out of the system at ~ ´2 105 years. The final eccentricity of the surviving planet was ∼0.03. The dashed red line denotes the corresponding ac derived by Holman & Wiegert (1999). Lower panel: time evolution of the semimajor axis (a a B B - ,0) and eccentricity (e e B B - ,0) of the inner binary. The first author of this work is Dr. Gong Yan-xiang, a postdoctoral fellow at the Purple Mountain Observatory.He worked with Researcher JiJianghui. This work is financially supported by National Natural Science Foundation of China, the Strategic Priority Research Program-The Emergence of Cosmological Structures of the Chinese Academy of Sciences, the innovative and interdisciplinary program by CAS, the Natural Science Foundation of Jiangsu Province.